France is a country located on the western edge of Europe, bordered by the Bay of Biscay (North Atlantic Ocean) in west, by the English Channel in north west, by the North Sea in north, by Belgium and Luxembourg in north east, by Germany, Switzerland and Italy in east, by the Mediterranean Sea, Monaco, Spain and Andorra in south. France shares also maritime borders with the United Kingdom. Since 1994 France and the UK are connected by the Channel Tunnel, a 50.5 km (31.4 mi) undersea rail tunnel linking Folkestone in Kent, UK with Coquelles, Pas-de-Calais, near Calais in northern France. With an area of 551,500 km² Metropolitan France is more than twice the size of the United Kingdom or more than twice the size of the U.S. state Colorado. 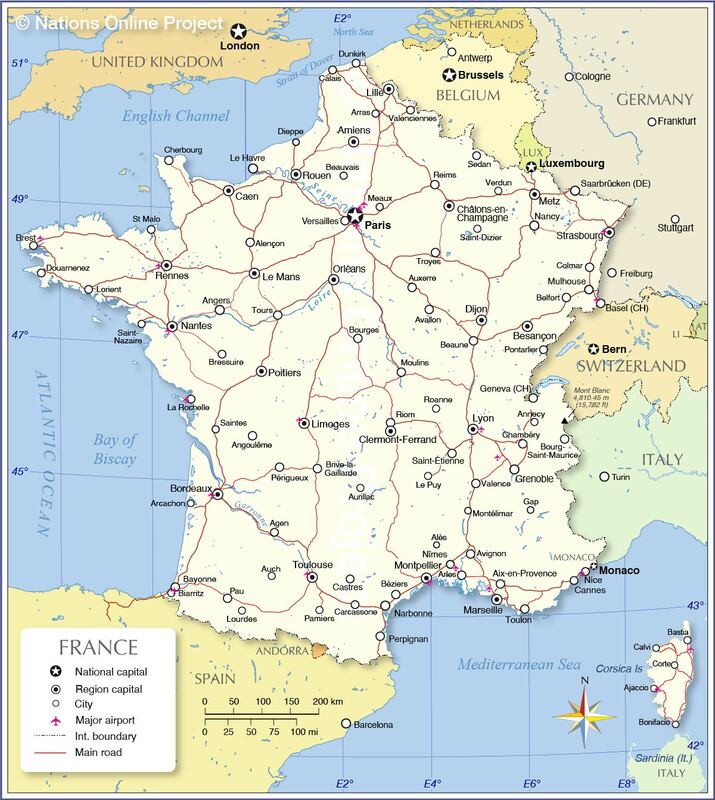 France has a population of 66.6 million people (est. 2016); 64.5 million people in Metropolitan France and 2.1 million in its overseas regions. Map is showing Metropolitan France, that is the French mainland and the island of Corsica. Depicted on the map is the country with international borders, the national capital Paris, region capitals, major cities, main roads, and major airports. Metropolitan France has two shorelines, one at the North Atlantic Ocean, the other at the Mediterranean Sea, it sums up to a total of 3,427 km of coastline. About two-thirds of the county's interior (in north and west) consists of plains or gently rolling hills, within there are two major basins: the Paris basin in the northwest, drained by the river Seine, and the Aquitaine basin in the southwest, drained by the Garonne river. The plains are interspersed with highlands here and there. To the south of the country are the rugged Pyrenees, two parallel mountain ranges that creates a natural border between France and Spain, its highest mountains rise up to more than 3,000 m.
In south east the Massif Central, a formerly volcanic region with a large concentration of extinct volcanoes, like the Chaine des Puys, a chain of cinder cones, lava domes, and maars within the Massif Central. East of the Massif, separated by a deep north-south cleft created by the Rhone River are the French Alps, part of the Alps, the great mountain range system of Europe. Within the Alps is the highest mountain of France, Mont Blanc with 4,807 m. It is also Italy's highest peak because the "White Mountain" sits on the border which separtes both nations. The longest rivers within France are Loire, Seine, Garonne, and Rhone, the Rhine river in east forms the border with Germany for about 160 km (100 mi). Seine, and Garonne are the main rivers for transportation in France. Paris-Charles de Gaulle Airport, also known as Rossy Airport (IATA code: CDG), located in the vicinity of Paris is the largest and busiest airport in France. Paris-Orly Airport (IATA code: ORY) located south of Paris is the busiest French airport for domestic traffic. France has several major seaports, largest port is Marseille, followed by Le Havre, Dunkirk, and Nantes/Saint-Nazaire. Agen, Aix-en-Provence, Ajaccio, Alençon, Alès, Amiens, Angers, Angoulême, Annecy, Arcachon, Arles, Arras, Auch, Aurillac, Auxerre, Avallon, Avignon, Bastia, Bayonne, Beaune, Beauvais, Belfort, Besançon, Biarritz, Bonifacio, Bordeaux, Bourg-, Bourges, Bressuire, Brest, Brive-la-, Béziers, Caen, Calais, Calvi, Cannes, Carcassone, Castres, Chambéry, Cherbourg, Châlons-en-Champagne, Clermont-Ferrand, Colmar, Corte, Dieppe, Dijon, Douarnenez, Dunkirk, Gaillarde, Gap, Grenoble, La Rochelle, Le Havre, Le Mans, Le Puy, Lille, Limoges, Lorient, Lourdes, Lyon (capital of Rhône-Alpes region; third largest city; pop. 720,000), Marseille (major seaport and second largest city; pop. 850,000), Meaux, Metz, Montpellier, Montélimar, Moulins, Mulhouse, Nancy, Nantes, Narbonne, Nice (fifth most populous city: pop. 350,000), Nîmes, Orléans, Pamiers, Paris (capital and largest city; pop. 2.2 million), Pau, Perpignan, Poitiers, Pontarlier, Périgueux, Reims, Rennes, Riom, Roanne, Rouen, Saint-Nazaire, Saint-Dizier, Saint-Maurice, Saint-Étienne, Saintes, Sedan, St Malo, Strasbourg, Toulon, ToulouseTours, Troyes, Valence (Drôme dep. ), Valenciennes, Verdun, and Versailles.